Bees and pollination have been on my mind lately. Summer months bring the enjoyment of sampling honey at the local farmers’ market, but more importantly, I’ve learned new things about bees from my daughter’s recent robotics team project — specifically, how much bees matter to humans and how their vitality is at issue. * As I observe bees moving from plant to plant in my garden, their process reminds me of the pollination we humans practice with sharing information. I’ve been in the thick of such a process for a few months, spreading the word about the recently published National Standard Practice Manual (NSPM). Our NSPM project team works in coordination with key partners and a newly formed Advisory Committee (collectively the “worker bees,” although mixed-gender in this case). If it hasn’t crossed your desk yet, see how the NSPM guides regulators and other decision makers on how to create a jurisdiction specific cost-effectiveness test for customer-funded efficiency programs. The policy-neutral NSPM offers core principles and a 7-step process for how a jurisdiction can develop a primary test tailored to its own policies. My earlier blog covers key details. Where is the NSPM Being Shared? The NSPM was met with a positive reception. Audiences recognize that it’s time to revisit how we approach cost-effectiveness. These presentations — and associated discussions — help raise awareness of the potential value the NSPM can provide. It builds on cost-effectiveness practices and experiences to date. As one example of this summer’s pollination, “A New Lens for Assessing Cost-Effectiveness – National Standard Practice Manual Heralds an End to Shortcomings” highlighted the NSPM at the NARUC 2017 Summer Policy Summit (view slides). Sponsored by the National Efficiency Screening Project, and organized by Home Performance Coalition’s Kara Saul-Rinaldi and E4TheFuture, the event brought together interested commissioners, regulatory staff, and other parties to learn about the NSPM and share their thoughts. Commissioners (Chairs) David Danner (L) and Ted Thomas at the July 2017 summit. The briefing included a panel of two commission chairmen who shared their perspectives on the value of the NSPM’s framework and set of core principles. Chairman Ted Thomas, Arkansas Public Service Commission, suggested that rigorous planning and building consensus helped Arkansas expand their energy efficiency programs, and that the NSPM could do the same for other states. He further noted that there’s still more to learn from the NSPM process on how to improve Arkansas’ energy efficiency programs. 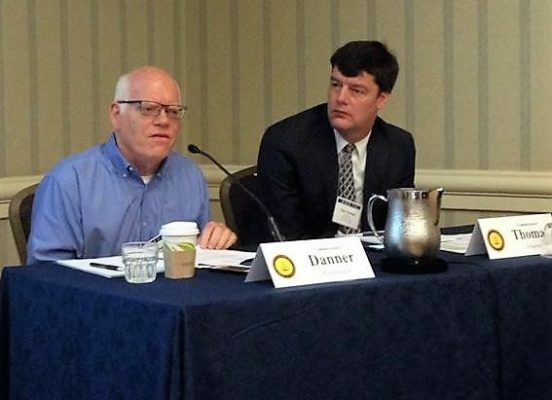 Chairman David Danner, Washington Utilities & Transportation Commission, said the NSPM can help Washington State find “pieces that they are missing” when setting efficiency goals and analyzing program cost-effectiveness. Despite competing with several other excellent breakfast sessions, the NSPM’s session drew commissioners from North Carolina, Arizona, Ohio, Kentucky, Louisiana, Alabama and the Virgin Islands, as well as regulatory staff from jurisdictions in Washington D.C., California, Michigan, South Dakota, and Rhode Island. This wide geographic attendance shows that states across the nation are interested in learning about and improving their cost-effectiveness testing practices. What’s Next for the Worker Bees? The NSPM project team, with guidance from the Advisory Committee, is starting to develop a series of case studies that can translate theoretical concepts into practice. We hear feedback that states need solid examples of how to implement the document. So we are pursuing leads in Washington, Rhode Island, and other states with the goal of publishing case studies this fall. Additionally, training on the NSPM will be offered at the Michigan State University’s Institute of Public Utilities (IPU) Regulatory Research & Education Program. I see this as a great opportunity for “new-bees” and seasoned professionals alike to learn how to best apply the NSPM in their jurisdiction. The NSPM project team is also excited that the NSPM will be presented at the 2017 ACEEE EE as a Resource conference, and is being planned for inclusion at the NARUC fall meeting in November. Both will be opportunities for further information sharing and learning with regulators and other key stakeholders. All this buzzing around and spreading the word should ultimately lead to some sweetness–perhaps not as tasty as honey, but arguably as important. Getting cost-effectiveness testing right for energy efficiency, and more broadly for other energy resources, is essential to helping states meet their respective applicable policy goals – whether they are economic, environmental, social equity, improved health, and/or other goals. A prototype to help bees continue their pollination unharmed by colony collapse disorder. *Keeping Bees Healthy. My daughter’s project involved a research element to find a way for people to help bee populations thrive. Did you know that bee pollination produces a third of our food source? And that the varroa mite is devastating colonies, with no known solution? 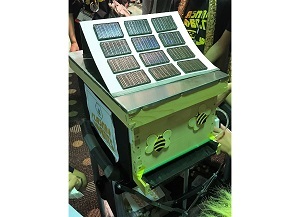 Aly’s team devised and built a solar powered mister mounted to a hive. Upon entry into the hive, bees can be “misted” with a benign chemical (top secret) that kills the mites but doesn’t harm the bees. The team is planning to run experiments with a local beekeeper, hoping to fully test their prototype. If you are interested in following NSPM developments and updates, consider becoming an NSPM member and/or contact NSPM@nationalefficiencyscreening.org.